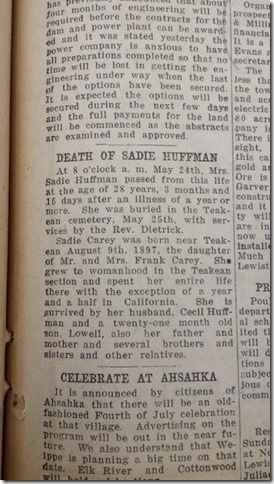 Sadie’s obituary was published in the lower left corner of the front page of the May 29, 1925 edition of the Clearwater Tribune. There are at least two errors. She was born in 1896, not 1897. Her age was 28 years, 9 months and 15 days, rather than 28 years, 3 months and 15 days. The text below is without any corrections. 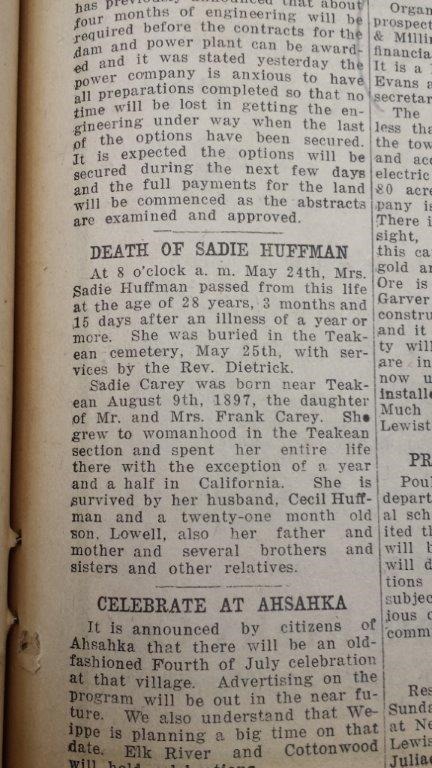 At 8 o’clock a.m. May 24th, Mrs. Sadie Huffman passed from this life at the age of 28 years, 3 months and 15 days after an illness of a year or more. She was buried in the Teakean Cemetery, May 25th with services by the Rev. Dietrick. Sadie Carey was born near Teakean August 9th, 1897, the daughter of Mr. and Mrs. Frank Carey. She grew to womanhood in the Teakean section and spent her entire life there with the exception of a year and a half in California. She is survived by her husband, Cecil Huffman and a twenty-one month old son, Lowell, also her father and mother and several brothers and sisters and other relatives.